Last week we attended the Desktop Magazine Create Awards. These annual awards celebrate some of Australia's best work across numerous categories. Our Managing Director Patrick Guerrera and designer Alex Creamer took the trip down to Melbs to represent RE and hopefully come back with a bit of metal. And by jove we did! Our work for the IAG Reconciliation Action Plan picked up Best Commercial Print Job, and our Optus rebrand was awarded Best Brand Identity and even better Project of the Year. Our expectations and baggage allowance were certainly exceeded. The Project of the Year award was given to us by the talented Andrew Ashton who had these kind words to say about the project. "I have been asked by the niche team to introduce the Create the project of the year, I also want say a few words about the judging. A few years from now you may be inclined to understand the communication design work made locally and you will realise, as I have, that Australia offers it's communication designers and artists few spaces to showcase work that is of a time. Thank you to Niche and Desktop for being one of the few. I have been lucky enough to have served on many awards panels, very few I walked away feeling uplifted. I must credit this spirit of curiosity, quality, rigour with a dash of generosity to my fellow panelists Michaela Webb from Round studios, Anita Riley from Seasaw and Che Douglas to be something great in New York. Whether your project is tonight's overall winner, or a finalist, in my opinion all the work and efforts recognised are special and worthy of being a part of history. Congratulations to all the selected projects, your delivery beyond the brief is clear. Now for project of the year. This project was selected because of it's special collaboration between client and studio. A special client (one of Australia's most visible companies) developed a unique a brand identity brief, which truly showcases the potential that great design communication can offer by connecting with one of Australia's biggest and diverse audiences. A studio who responded with a comprehensive creative package – from the fun and detailed custom font, to the desirable and distinctive mascot to be skinned on trams in Melbourne, corporate reports, phone bills to retail shopping bags. This project and process allowed an exciting retail brand identity, created by a special Australian studio, to be one of this region's recent triumphs in brand creative and identity rollout. 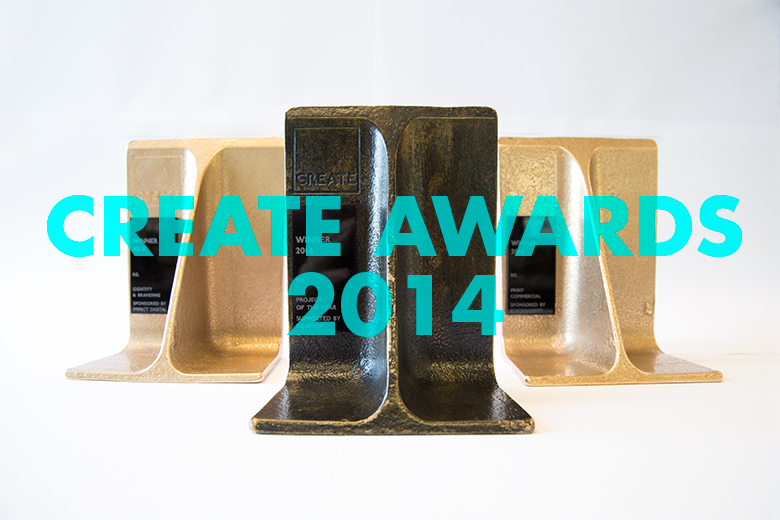 Congratulations and welcome 2014's Create Awards – Project of the year — the Optus Retail Brand Identity and Campaign by RE Sydney." Thanks to Andrew and everyone at Create Awards.